Whilst I was die cutting I thought I'd make another card for the Less is More Challenge 51 with the theme of "Cut it Out". I used Tim Holtz's Butterflight On the Edge die but used it in the middle of the card, then hand cut the rectangle. Again with pearlescent and textured scraps, I cut the butterflies individually and glued them over the die cut. Simple to do but just make sure you cut them the right way - I didn't so had to turn my card inside out. Doh!! 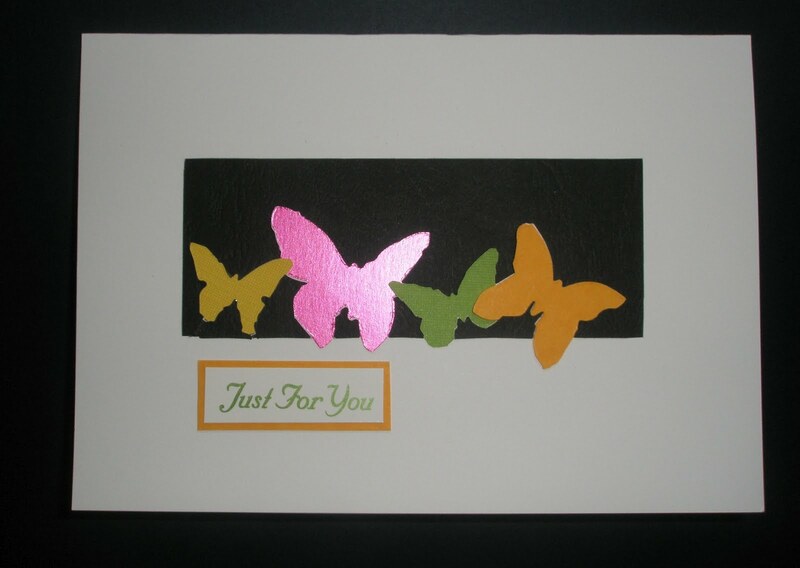 I just backed the aperture with some black card to make the butterflies stand out, and finished with a sentiment. Those butterflies look great against the black Elaine! love your card - I haven't seen this die before but certainly one I will put on my list.